Leeds Beckett University graduate James Hughes has made a bench with metal spikes embedded in its seat to highlight issues surrounding hostile urban design. Called Hostile Bench, the item features a seat that is covered in metal spikes that are overlaid with a transparent surface. Hughes designed the bench to bring attention issues surrounding hostile architecture – pieces of infrastructure that are constructed to discourage people from using them in ways they are not intended. "Hostile architecture is most typically associated with aggression against the homeless in the form of anti-homeless spikes — studs embedded in flat surfaces to make sleeping rough uncomfortable and impractical," said Hughes. "It often targets the city's most vulnerable, both intentionally through anti-loitering and anti-skateboarding measures and unintentionally by making the cityscape hostile to all parts of the public, especially seniors, people with disabilities, and children," he continued. 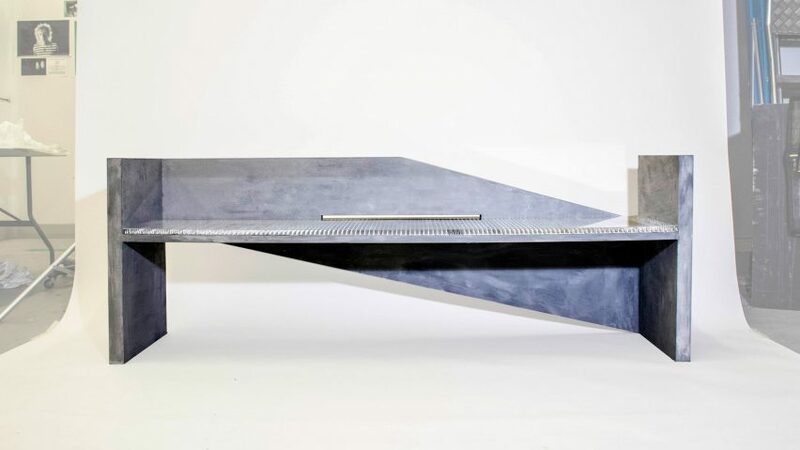 To highlight the issue Hughes, who studied a bachelors in Product Design at Leeds Beckett University, decided to create a piece of furniture that can be used by everyone, but visually incorporated an element of hostile architecture. "The inclusion of a hostile element within a piece of furniture used everyday day by most members of the public was a suitable starting point," he said. The bench has a concrete body with no obtrusive armrests or gaps in its structure, meaning that along with sitting, the seat could also be used to sleep on. It also has two tall end pieces that can be used to attach covering from wind and rain. "Spikes are deemed as the most vulgar method of deterring activities, thus further impeding individuals who must seek temporary shelter at night further," he explained. The project is meant to provoke conversation about hostile architecture and its effects on homelessness. "The use of hostile design in an urban landscape does provide necessary benefits, ensuring safety for the public and maintaining an efficient flow of direction and purpose for all," said Hughes. "It could easily be suggested that the use of hostile architecture could be a way of segregating the social classes, and expanding the gulf between the poorest and richest in society," he continued. Hostile Bench was on show at New Designers week two, which took place between 4 and 7 July 2018. Other graduate projects created this year include a series of brass tools that aim to encourage muscle memory to help train dancers and a portable cooking set for kitchenless millennials.